Italian agritourism is an original form of tourism in the countryside that has developed in Italy over the last thirty years. Its unique feature is that it can only be practiced on farms and by farmers, who are its true protagonists. Agritourism, often referred to as agrotourism or farm holidays, has by now become a cultural phenomenon that is spreading to many countries in the world, particularly in Europe, thanks to the great attraction the countryside holds for an increasingly urbanized society. Thus the farm, surrounded by greenery and the rural landscape, becomes a place for a complete but simple rural experience, far from the formalities and bustle of the city. In Italian, the word agriturismo is used both for the phenomenon of tourism in the country and for the tourist farm itself (e.g. “I went on holiday at an agriturismo”). 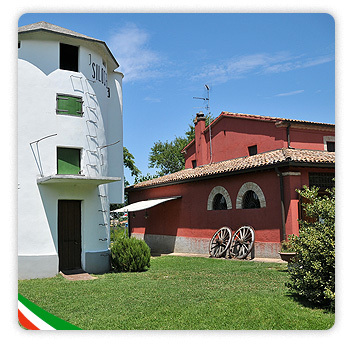 Nowadays, even many foreign tourists prefer to use the word agriturismo instead of one of its many translations. Thanks to agritourism, which today has more than twenty thousand operating farms, the Italian countryside has been able to save a very significant number of valuable historic farm buildings and preserve traditional agriculture in areas difficult to cultivate. A large percentage of tourist farms are in fact located in hilly and mountainous areas where large-scale agriculture requiring vast expanses of land and heavily mechanized production systems cannot be developed. Agritourism instead favours small-scale production systems, integration with the environment – particularly with woods, forests and Mediterranean scrub, as well as proximity to the cities and their art and to ancient towns and medieval or Renaissance villages. Agritourism thus gives its guests the opportunity to observe at close range the places where Italian art originated and developed, and which still preserve many treasures for the visitor to discover. Get to know Italy through the historic areas it is made up of.